With Easter round the corner, it’s time for the Easter Bunny to come out of its burrow with colourful Easter eggs. Easter eggs comprises of hard boiled eggs decorated beautifully or chocolate eggs or jewelled eggs or plastic eggs filled with treats and many more. Dominating the pre-celebrations of Easter is the very crucial task of buying Easter eggs or even more popularly making your own super pretty ones. 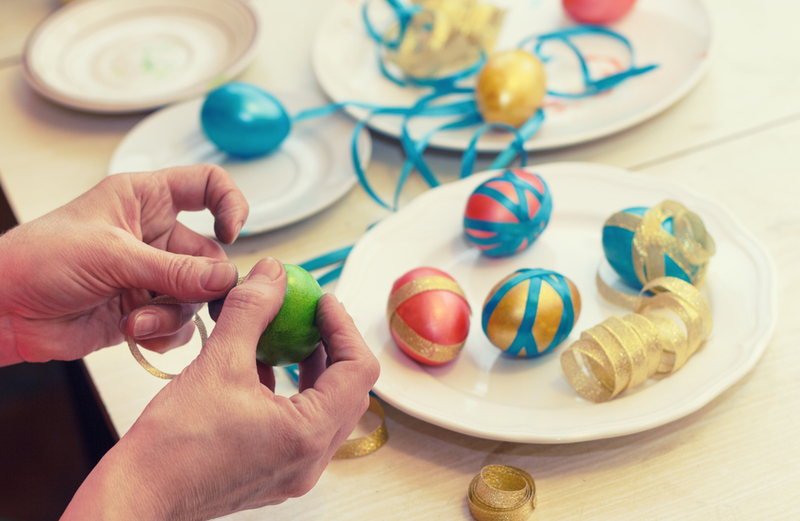 There’s nothing like a good DIY and in case of decorating Easter eggs, the ideas are literally countless. Read on and give a creative twist to your Easter eggs this year! Fabric patchwork on Easter eggs is not only super pretty to look at but it also takes your DIY skills a notch higher. All you need is scraps of colourful fabrics and some glue with the obvious inclusion of the star of the show- the eggs. Cut the fabric into thin strips about 5mm wide and stick them side by side along the length of your egg. Go on sticking the different fabric strips till the whole egg is covered. Mix and match the colours, pattern and textures for the best outcome. This is a very quick DIY and it won’t be long before you have a basketful of colourful fabric patchwork eggs for a fun Easter! This DIY is done best with blown eggs as they are a whole lot lighter than hard boiled ones. Just pre die the eggs and then paint them in any patterns you like whether its polkas or stripes, or maybe stick on embellishment and sequins. After the eggs are dry and done with, go an extra mile of creativity and make a bunting with it. String a thin ribbon through the holes the blowing had been done and hang up the eggs by these ribbons using small wooden clothespin on a string of nylon thread or coloured rope. Your colourful egg bunting is ready to spruce up your doors & windows this Easter! Still thinking about merely dunking an egg into dye and leaving it at that? Well, this Easter take it one step further and see the difference. 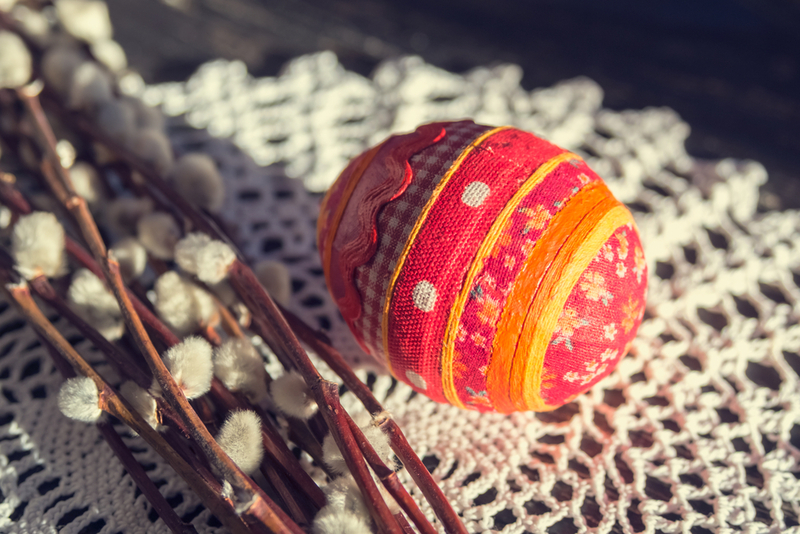 All you have to do is wrap colourful ribbons or pretty bits of lace around the brightly dyed eggs. Put the glue onto the ribbons first and then lay the egg at one end of it rolling it until the full ribbon encircles the egg uniformly. Choose bright colour combos like a red egg with yellow ribbon or a green egg with pink ribbon and be sure to have a vibrant Easter. Stencilled eggs are as beautiful as they sound and the outcome is way better than you would expect. This is a great option for those who don’t trust themselves with freehand doodles or illustrations. You just need to grab hold of egg stencils and paint. Paint the eggs with a bright base colour and then put the stencil on it and dab on the paint of a contrast shade. Remove the stencil and voila! You have your very own masterpiece. If you don’t have readymade stencils you can make your own. Just use a craft knife to cut patterns onto strips of tape and stick it onto the egg prior to dabbing the colour through the holes. Now you can deck up your eggs with floral, geometric, Aztec patterns and so much more this Easter. This DIY is the most time saving and perfect for all those who have been blessed with a good handwriting or calligraphy skills. 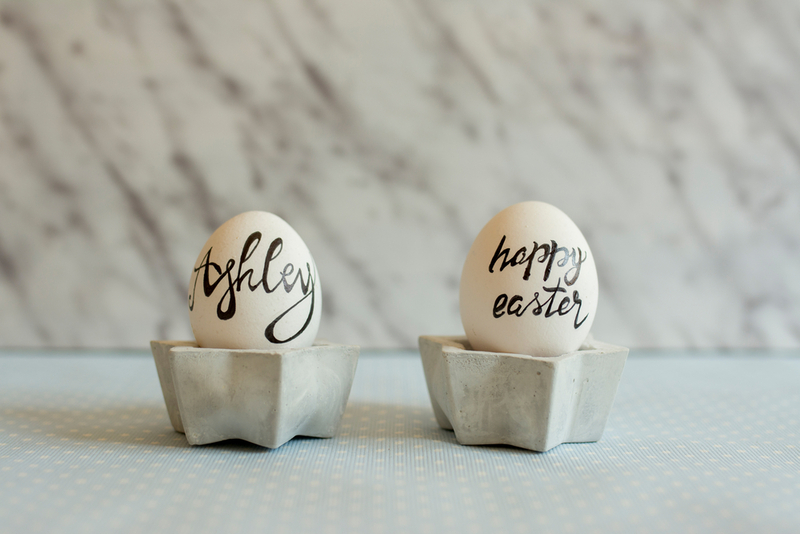 All you need is pre dyed eggs and a permanent marker or calligraphy pen. Just take the egg and scrawl on it a personalized holiday message for your loved ones. You can also write down the name of the person whom you are giving the egg and maybe doodle a heart or two around it. It looks effortlessly beautiful and will be cherished by one and all this Easter. So, the ideas are endless and the fun is limitless. 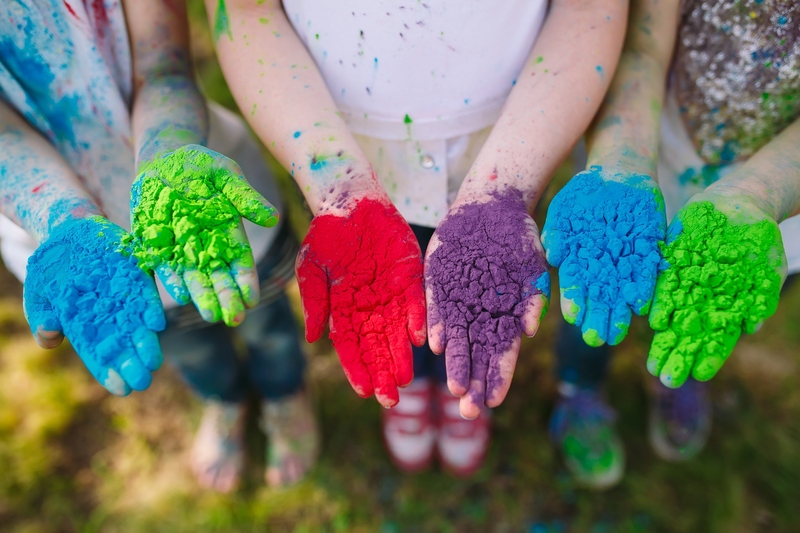 Play with colours and patterns to your heart’s content and create your own masterpieces. 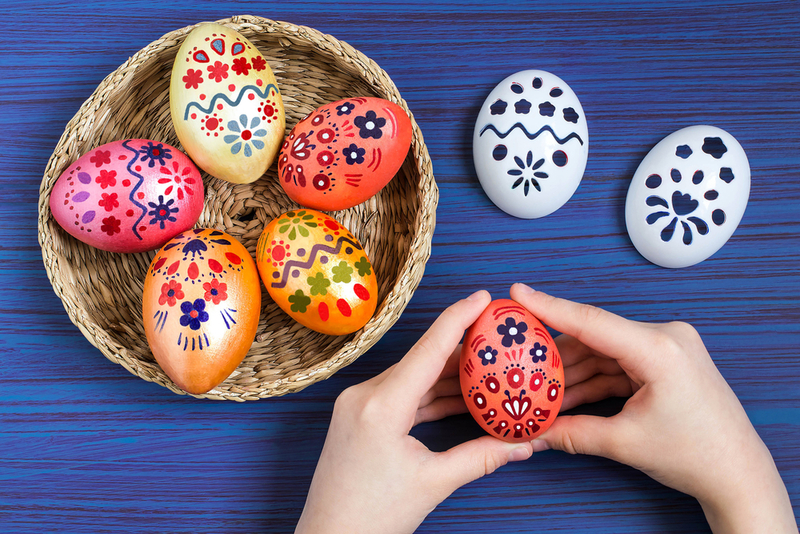 Wish you a Very Happy Easter and make sure to have an egg-citing DIY time!